Japanese researchers led by Kenji Osafune report the successful generation of mesoderm kidney tissue from induced pluripotent stem cells. 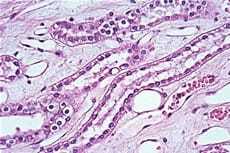 This particular tissue type—between a stem and an adult kidney cell—was used to grow part of a urinary tubule. While safety issues need to be addressed, this study in Nature Communications could lead to new therapies for kidney disease.